Disinfo agents self-"exposing" beyond what is scripted, the second time without quotes, as a consequence of the BIG LIE technique. From "palestinian" boy beheaded by fake rebels to, days later, bombed boy dropped on chair by fake first responders. Illuminati psy-op meant to discredit the White Helmets heroes, the first responders digging bodies and rescuing lives from the rubble since 2011. Meant to have psy-ops "commenting" "Sad/weird that White Helmets were more intent on using the boy for a photoshoot than comforting him". Mockery went as far as to reuse the same fake rebels of Nouredinne al Zinki casted days earlier in the beheading of the "palestinian" boy, an episode of same type as the main dish served with ISIS: beheaded. Obviously almost immediately after "exposed" by the Illuminati web of disinfo. The infiltrators playing rebel supporters focus on the Omran psy-op. Many of them went as far as to keep it on top of their twitter page since it was staged, Aug 17, while mixing it with reports on real crimes. ... the easier it is ALSO to expose it. By apllying the "BIGGER the lie ..." the illuminati are also more obviously exposing not only their agents as infiltrators but also how they use another BIG LIE technique: half-truths. In the last months illuminati media no longer conceals that every day dozens of children are murdered by air bombins in besieged east Aleppo. - hoping that this will totally demoralize the population. BBC shows east little girl covered in blood under the headlines "Aleppo: Where is my dad? ", meant to be later "exposed" as the "it was not in Aleppo" fraud. So how come the illuminati continue to serve these type of child psy-ops as the ultimate bunker bombs stage was already reached? The answer: the audience no longer consists of humans, as at the End of the Age they were all reduced to beasts. "This how treat a child after getting bombed? Throw him on a chair & starting taking good pictures right?" Two months later: An infiltrator playing rebel supporter has the psy-op photo on top of the page since it was staged, Aug 17, while continuing to report on real crimes. Photographer of Bombed Syrian Boy, Pictured/on Video With Militant Rebels Who Cut the Head off a Young Child. Oct 11, 2016 - Aleppo: "Where is my dad? by BBC "news"
It's called Illuminati parallel scripts. From 2013 Aug: Syria: Illuminati media, shows, other than directly marketing Assad & his butchers with interviews: only fake rebels (ISIL), fake fights, fake terror attacks, fake activists, fake victims. see "Mountains are being built very fast" in this article mixing real news and the related "scientific explanation" to keep human cattle robotically repeating that black is white. Note how the KEY visual element is omitted: the "illustrating" photo does NOT show this epic landslide. 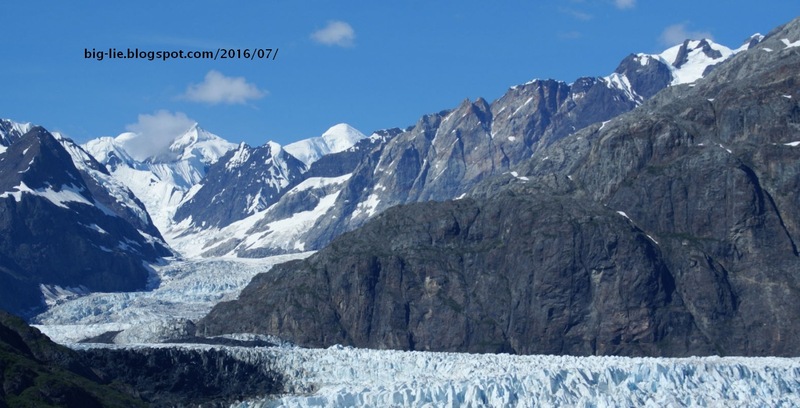 ... over 100 million tons of rock collapsed from a 4,000 foot high mountainside in Glacier Bay National Park. 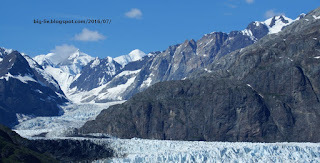 The debris spread out over six miles onto glacier below and produced a huge cloud of dust. "It rivals anything we've had in several years, ... the amount of rock that fell is comparable to 60 million SUVs falling down a mountainside" said Colin Stark, a geophysicist at Columbia University's Lamont-Doherty Earth Observatory . Stark says that mountains in the area are particularly fragile because of of shifting tectonic plates. "Mountains are being built very fast and they're also being destroyed very fast because the rocks are weak and glacial erosion is very powerful,"
- reveals ALL of the WORLD's BASIC FACTS as expected from End Times Reductitonism. - totally destroys the world as you know it, as expected from the BIG LIE technique pushed to the utter limits. It consists of assumed and unquestionable facts, with Temporality and Veracity types, among others. Daily headlines about the "Palestinian-Israeli conflct"
 this week, in a matter of two days, the "ZIKA virus exploded around the world". YOU will accept MANDATORY vaccination against the "super virus pandemic" hoax. Logically unquestionable such as , Unquestionable such as  both referred to as undeniable. The rest such as  and  is questionable, yet to be proven either true or false. After executing what is detailed below you will know the answer to the four questions that appear by applying "WHY" to the previous four facts. Here is the answers in advance : because it's a complete hoax. It consists of of the undeniable facts that implicitly matter the most to you. In other words: what logically explains what's going on in the world. Two steps is all it takes. 1. Apply the "WHY" operator to the undeniable fact. 2. Apply logic to your start list of UNDENIABLE facts to get a consequentlty undeniable answer. In the simplest case the answer comes right from your start list of undeniable facts. Ottherwise you will need to first establish the veracity of other logically required assertions. In this sub-proess you additionally use other operators such as WHAT, WHEN, WHO or HOW. Note that each time that you need to again apply "WHY" you are in fact entering a recursive process. - We know since 2013 that in 2011, at the start of the war, Assad had one of the world's largest chemical arsenals. - 12 million displaced including 4,5 million refugees in other countries out of a population of 20 million. - not only all cities (Idlib, Ariha, etc) but also all city parts (Aleppo the largest, Damascus the capital) under rebel control are reduced to rubble by air bombings within months. - since 2011 Assad bombs civilians and since 2013 drops barrel bombs and chemical weapons deisgned to target primarly civilians using helicopters flying at low altitude. - this possible because rebels, after five years of war, still have no anti-aircraft wreapons whatsoever. - videos of global destruction (starting with drone footage) and war based on targeting civilians (starting with helicopters dropping barrel bombs on markets, schools) totally censored in ALL TV stations. - Assad's conscription means fighting along iranian and lebanese sh'ia butchers, which for most syrians means to target their own families as 80% of syrians are sunnis. - refugees first fled bombs and conscription into camps in Jordan, Turkey and Lebanon. - they started massively trying to enter Europe after the UN drastically reduced food stamps at these refugee canmps mid 2015, upscaled months later by dayly dozens of russian airstrikes against civilian targets. - previous fact totally censored in all media, not to mention any real interviews with refugees, which necessarily had to start by touching the previous facts (bombings, conscription). - russian most advanced attack weaponry, from helicopters to jets, since Sept 2015, tens of thousands of iranians since 2012 in a country bordering NATO's Turkey and Israel. - same for russian most advanced anti-aircraf systems since Dec 2015, although the rebels have no airforce whatsoever. - although Iran named Israel as its #1 enemy and is also the only government officially denying the Holocaust and claiming that it will destroy Israel: not a beep from Israel's government, not to mention military action. - although Russia is officially Iran's main weapons supplier: Israel government announces "military coordination" with Russia. - not one single government has presented a demand to expell Assad from the UN, while scores call for expelling Israel. Apply the previously presented algorithm to the first of these undeniable facts. WHY did Assad have one of the world's largest arsenals of chemical weapons in 2011? - confirm the veracity of all the previous facts about the Syria war. - confirm that the ZIKA virus pandemic is a hoax and the (logicallY unquestionable alias) undeniable fact that almost everyone (billions) who will be targeted with the KILL SHOT will accept it. At this point you can imagine how much will you know about the world's BASIC facts after fully answering that one question. At some point you will have to pose the question: why will almost all accept the KILL SHOT? The answer was already given much earlier than when you reached this point: Why did almost all accept the genocide of syrians? An answer that requires you to know this: What are the basic facts about the Mark of the Beast? An answer given by Last Prophet in one of the two most important pages written in the short story of the web but also the most horrible page ever written. The completed illuminati matrix: implicitly totally exposed by freedom loving syrians. Illuminati World Wars and Illuminati Matrix all basic facts exposed worldwide first by Last Prophet Matt, one of only two members of the Web of Truth. Last Prophet's words (revised) from Sep 11 2015, one week before the illuminati "victory" in Greece. In other words: nine months after the illuminati "defeats" in the January 2015 "election" and two months after the "NO" to "EU austerity" in the "referendum". 1. - Turkey and Greece. Missing detais include the staged coup in Turkey, see added link in the Basics section. 2. - UK, Portugal and Venezuela, although they are each mentioned only once in article's body. Costa, since November 2015 prime-minister in Portugal plays additiionally the same role in setting the stage for the manhunt for non-whites as the muslim mayor of London additionally does for muslims. 3. - every other nation of the IV Reich, although they are not mentioned even once in article's body. Staging a previous "defeat" to be soon turned into a victory is a psy-op technique based on "the bigger the lie the more people will believe it" foundation of the BIG LIE framework. In other words: the introductory step, the defeat, is meant to make the coming victory more credible. - to decisevely discredit the cause that was supposedly victorious in the first step. Maduro in Venezuela since 2013, Tsipras Greece since January 2015, coming remke of Greece in Portugal with "leftist" Costa, coming Brexit victory. 1. stage not one but TWO introductory defeats before the soon coming victory. 2. will stage their victory is as "defeat". In other words: in the coming September election and unlike the January election and the result of the July referendum, Tsipras will fail to form an "anti-austerity" government. - destroy the credibility of the "opposition"
- have greeks swallow "austerity" pushed to new limits that would otherwise lead to a dangerous uprising. "Elections" totally rigged, all parties controlled by the illuminati, same as in the rest of the IV Reich. Tsipras first ilflicts a defeat to the illuminati, not once but twice: January election and 60% (in reality 80%) in the referendum, or in other words both times "anti-austerity" absolute majority. - forced into an alliance with a "right wing" party and so push the robbery of greeks even further, continuing to use the same mockery: Greece's sovereign debt". 2015 two elections: coming repetition will turn "Erdogan's defeat" in Jul 2015 with 42% of the votes and failure to get absolute majority into a victory. Reality Erdogan got just over 21% of the votes, similar to what Cameron got in the UK and was served as "37%, enough in the UK for absolute majority". - Erdogan, unlike Tsipras, doesn't play suicide bomber. Kirchner, Roussef, Morales, Maduro, suicide bombers transferring national assets to central illuminati safes dressed as "leftists": ALL will now FULLY detonate. For a start: Argentina: Crisitna Kirchner blows herself up weeks before Maduro in Venezuela. Dec 4, 2016 - "Italia referendum to transfer more powers to the prime-minister": same day as "Austria: first far-right president in Europe since Hitler". What is this illuminati joke about? Answer: the day in 1934 when Germany's chancellor Hitler became "Fuehrer des III Reiches". "‘Incredibly intrusive’: Windows 10 spies on you by default" illustrates the half-truths technique, part of the BIG LIE. What matters is "exposed" is just a mean to have the audience swallow the core lie. "How to stop the Windows 10 Upgrade from downloading on your system" = Illuminati mocking human cattle while diverting from the ONE BASIC FACT about Windows. Reality: as soon as you start an internet connection on any Microsoft (Windows) or Apple (OS X) operating systems illuminati are able to access ALL the contents of any devices connected to your computer, as exposed by Prophet more than a decade ago. MICROSOFT: SPY Algorithm was revealed years ago - but who echoed it? IV Reich military (NATO, Russia, Iran, etc) air bombing and/or supplying ground troops and weapons to suppress the revolt of freedom loving people. - Yemen: IV Reich tries to reinstall a puppet, Saleh, who 2012 had to be "deposed" and replaced with another puppet, in this case Hadi. Same basic type of illuminati theater as 2013 in Egypt, Morsi with Sisi. 1. Iran has been an illuminati puppet government for even longer than Saudi Arabia, where illuminati only got complete control after the "1973 oil crisis". 2. 2014: Yemen's president Hadi's role was to let the illuminazi agents dressed as "Houthis" take control. 1. Saudi and Iran government are enemies. 2. Deposed president Hadi (by Houthis, now officially allied with Saleh) and deposed president Saleh (previously replaced by Hadi) are enemies. To get why it's a BIG LIE all you need is another BIG LIE: "Yemen proxy war Saudi vs Iran". These headlines also illustrate the ultimate type of rewriting reality, "black is white": the fake war will be used for a real war, bombing the real rebels who are fighting against the "Houthis". THEN the fake war "Saudi led coalition against the Houthis" will be used to send ground troops and indeed reinstall puppet Hadi in Aden, as last resort to prevent freedom fighters to take power. Paradoxically in this case the BIG LIE in BLACK is WHITE "Saudi Arabia starts air strikes to reinstall deposed president Hadi" would apparently become only a half-truth. Yemen "news": mix of SIMULATED REALITY and black is white, mix of real and fake blood. The only military targets will be the REAL rebels (called "Qaeda by media) NOT the FAKE "rebels" that media calls Houthis. - in the south, Aden: carry out the genocide of sunnis. - in the north, Sanaa: have the masses rally behind the "Houthis". 1. Yemen war: divert from the war crimes of "Houthis"
2 Saudi Arabia: advance the agenda "saudi government playing suicide bomber", scripted to end with yet another staged coup, again with puppets playing sunnis replaced by puppets playing sh'ia. - first all the UN and "humanitarian" organizations denounce the Saudi crimes (this is also part of the preciously mentioned Yemen war diversion agenda). - later use these crimes (for one time real) to stage the "trial of Saudi government by the Hague Internationl Court for War Crimes". 3. Global: agenda "war through bombings against civilians" as the new norm. In other words: until the staged regime change in Saudi Arabia the government will continue to be praised by US, UK & Co, starting with the hoax "again the #1 buyer of western weapons". - the Yemen coup 2014 as a remake of the Syria coup 1970, with illuminati using the shi'a minority to secure control. - Hadi's staged escape from Sanaa to Aden as a stoppver before the final staged escape to Saudi Arabia, in a remake of the role of fake Yanukovich in the staged Maidan revolution in the Ukraine. Mecca Haj: crane kills 111 faithful : ZERO DEAD mockery, hidden 111 symbology. "The disaster, the latest in a series of deadly mishaps to hit the haj" part of these agendas: destruction of icons of false religions, END of SHOW. - Bin Laden family runs company of crane that crashed on 9/11 2015. - crane crashes on roof, doesn''t even break apart, so no logical reason for anyone to be killed.